（The Yomiuri Shimbun） KYOTO — His press conference outdrew the one for a Nobel laureate. 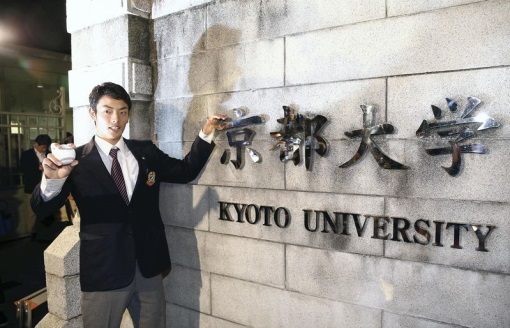 Eisuke Tanaka’s ability to master the mechanics of pitching, along with industrial chemistry, have put him in position to become the first pro baseball player out of prestigious Kyoto University. “I’m taking the first step in a new direction,” said Tanaka, the No. 2 pick by the Chiba Lotte Marines in the amateur draft held Thursday. “I’m grateful to be so highly evaluated.”　Tanaka watched the nationally televised draft on the Kyoto campus with his teammates, who let out a roar of delight when his named was announced. “It was special that it made them so happy,” Tanaka said. Tanaka then proceeded to a press conference packed with more than a dozen TV cameras and a throng of reporters. One university official said the crowd seemed to be bigger than that for Kyoto professor Shinya Yamanaka when he won the Nobel Prize in Physiology or Medicine in 2012. Attending one of Japan’s top universities, Tanaka, who has a fastball clocked at 149 kph, was torn on what career path to pursue. While excelling on the mound, how many other baseball players have completed a senior thesis titled “The Theory of Inverse Calculation of Hydrated Structures by SFA (surface force apparatus)”? He had already lined up a job with a major trading company after graduation, but his eyes turned to pro baseball after pitching in an exhibition game against the Hanshin Tigers’ farm team in August. Although Tanaka allowed six runs in seven innings, he held the pros hitless from the fourth inning on. Seeking his father’s advice, he was told to go for the tougher challenge. Tanaka’s development into a draft-worthy pitcher came despite playing at schools without top facilities. Up until last summer, Kyoto had no lights on its practice field, and his high school, Hakuryo in Takasago, Hyogo Prefecture, had no backstop for its diamond.“For a pro player to come out of a high school without a backstop is a miracle,” Hakuryo coach Shigenori Takami said.